The Numark DJ2GO2 is an ultra-portable, pocket-sized DJ controller that you can take absolutely anywhere. Complete with a built-in sound card and Serato DJ intro (Serato DJ upgrade ready) it fits on top of your laptop so you have a complete DJ rig without taking up any unnecessary space. Whether you want to use it to audition DJ sets at home, perform at space limited gigs or just use it as a backup to your main controller, the DJ2GO2 will perform perfectly. With a built-in sound card with master gain, headphone output for cueing and channel gain knobs, the DJ2GO2 is the ultimate in portable DJ controllers. It has two channels with a familiar crossfader as well as pitch faders for easy blending. Don't be fooled by the small size of the DJ2GO2, it also has features including pad modes that are typically found on much larger controllers. The DJ2GO2 was designed with every DJ in mind. Traveling DJs will enjoy having the critical elements on the go to practice, prep, and adjust their set. Mobile DJs can use it as a back-up or for a small gig with a minimal setup. Every control is at your fingertips - simply plug in your headphones to audition your music and connect to your desk or amplification via the master output. If you already use Serato DJ the DJ2GO2 comes premapped with Serato DJ intro included and is upgrade-ready to the full version of Serato. The DJ2GO2 is also capable of standard MIDI mapping so it can be set up to use Virtual DJ, Traktor, Mixxx and many more. 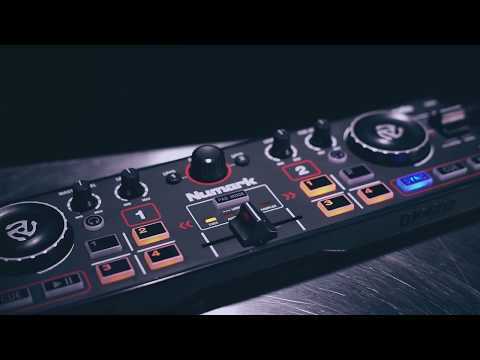 For the ultimate portable DJ rig that will require no more space than your laptop, the Numark DJ2GO2 Portable DJ Serato controller presents new possibilities for DJ's of all levels and styles.